This book is the only expansion for the current 4th edition of Epic. 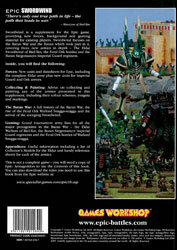 The expansion has been broken into a series of PDFs and appears on the GW specialist games website. The hardcopy of the book is actually no longer available, being only printed for a limited time. Which is shame, because the printed version is in full colour and the PDFs are missing out the hobby sections of the book showing painted miniatures and terrain ideas. The book itself is nicely laid out. All the pages are full colour (where as the PDFs are black and white) and there’s lots of background on the three races and their respective units in the book. The hobby section is very nice, showcasing most of the models available for the armies in the book, with emphasis on the Eldar miniatures. At the back of the book is a good section on using legacy miniatures both for use in tornament play (count-as) and for general play (unit stats).